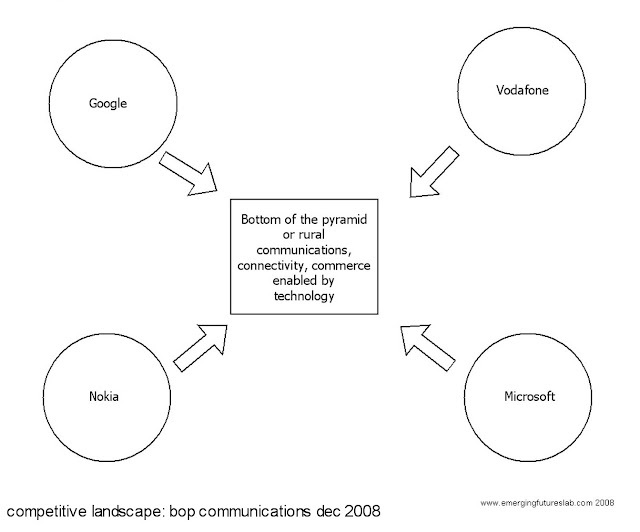 When Vanderbeeken sent me a link yesterday about Nokia working closely with Facebook to get the next billion online, it reminded me of this crude diagram I’d constructed back when I was watching this space far more closely than I do now. Twitter and Facebook are the two big names that weren’t even on our radar, although one could argue that neither is a technology provider per se but instead they are the connectors, once people find themselves online. Reflecting on this diagram now, a full 4 years on, one can see that while there have been bumps in the road for each of the players, they are each still active in this space. Emphasis however has changed. Whereas it used to be more about the mobile operators and the devices i.e. the Nokias and the Vodafones; today its more about the OS and the applications. Particularly of note are Google’s activities with Free Zone – their aim to become a global ISP for the next billions, far more than Microsoft who increasingly seems like a passive player in this segment. The challenge still remains, I believe, to connect everyone coming online, to each other, just the way the internet enables us to communicate and conduct commerce. That is, while social networks like FB are certainly paving the way in the developing world with attempts to help lower the cost of data, the last formal barrier to complete integration of the planet’s population has yet to be cracked. On the other hand, one wonders if literacy per se, may not be the sole barrier among this demographic as much as the intimidation of user interfaces which maybe unfamiliar or strange. There is a natural barrier of contextual knowledge and textual communication ability that services like Twitter and Facebook contain by virtue of their nature. One sees the efforts to focus on what is known as “the third billion” – women, who make up the largest proportion of the uneducated. And they are the ones who probably need this connectivity and all it implies, the most. This is true. What is sad is that if I’ve seen this in the 6 short years I’ve been observing this space, Ken speaks from longer and deeper experience. As the diagram above and the activities and changes seen across the developing world demonstrate, we have come a long way, but its not enough. The emphasis has been on the technology and the cost, rather than the people its meant to be used by. Now its time for that to change if we’re to leap across the divide. As Vanderbeeken would say, we need to be Putting People First.